When I picked up ‘Hullabaloo in the Guava Orchard’ by Kiran Desai, I was in two minds as to whether this book would be a light hearted comedy as evident from its very title or it would be an intense emotional drama as expected from the daughter of the famous Anita Desai. However, in the end, to my utmost satisfaction, the novel turned out to be a perfect blend of humor and emotions with the effervescent wit of Kiran infusing it with a fresh appeal. The novel tells the story of a simple minded but highly imaginative Postal Clerk, Sampat Chawla, who is a misfit in the highly competitive world of the small town of Shahkot, is looked down upon by his own father, is ignored by his colleagues and considered a wimp by most of his acquaintances. The weaknesses of Sampat have a logical explanation in his food obsessed crazy mother, frustrated yet over-optimistic father and the over conscious little sister. In short, the entire Chawla clan is slightly eccentric, completing a dysfunctional family, with its torch bearer Sampath, being confused and totally disillusioned with the world at large. To give due credit, Sampat tries hard to fit in the society, but the more he tries, the more is his strangeness exposed to the world, further belittling his almost non existent confidence. After a few failed attempts, he gives up and runs away from home to climb and sit atop a guava tree! And, this is where the actual fun begins, with the insignificant Sampat becoming the talk of the town, famous as an other-worldly philosophical, extra ordinarily wise man. All his previous misadventures are forgotten and he finds wide acceptance among his town folks, his family and even gains a few female admirers. But, will Sampat be happy to revel in this new found reverence or will he forgo it all to spend time alone, forms the gist of the novel and in Kiran Desai’s deft and crisp narrative, the story becomes loftier than expected and I enjoyed each twist and turn, laughing out aloud. Though, I could guess the climax, three pages before the novel finally ends, the author presented it in such a hilarious manner, that it had me in splits again, and I was reluctant to put down the book even after it was over, with an insatiable urge to see more of its funnily crazy yet adorable characters. But, Hey! I am a critic, and I can not finish a review unless I point out at least one small imperfection ): Though, it is not easy to point out a defect in such a nicely written book, but at times, I found the narrative to be too fast, and I had to race along breathlessly to keep pace with the author’s sharp mind and even hastier execution. Sample this, in one line Sampat’s father thinks about making a fortune out of his son’s newly acquired fame, and in the very next line, his wonderful plan has already been executed, with his family well settled in the distant orchard and he is shown juggling with a huge rush of pilgrims. Phew ! In such moments, I had the feeling of watching a Bollywood movie, where the innocent toddler grows up into a handsome hunk in the space of a two minutes song. 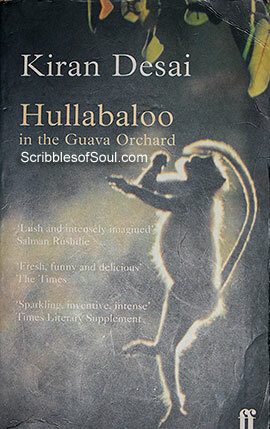 However, all said and done, ‘Hullabaloo in the Guava Orchard’ is, definitely, one of the most hilarious novels, I have read over the last few months and it has become one of my favorites. I would definitely like to read it again and again, and, I am sure, that it would manage to bring a smile on my face every time and make my day.